Incorporated deleted, alternate and supplementary footage and made numerous edits to original scenes to strengthen story, clarify character motivation, and address some often-mentioned issues viewers had with the original theatrical release. 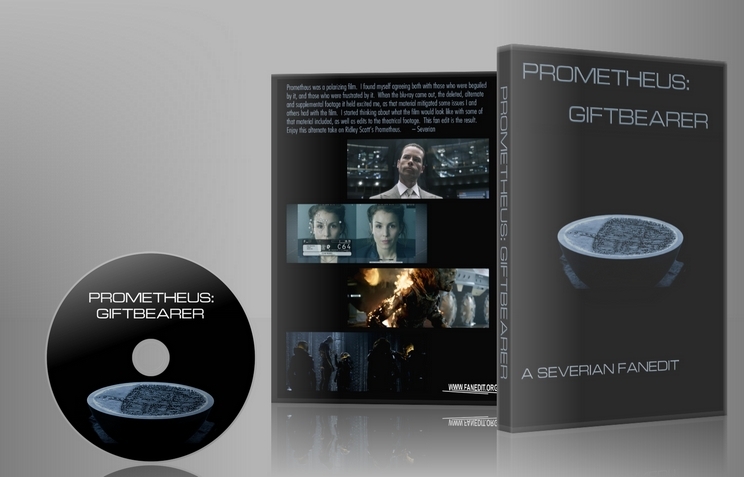 Watching the excellent deleted and alternate scenes in the Blu-Ray extras convinced me Prometheus could be a better movie with those scenes included, and then making my own changes followed naturally from there. njvc, white43, and darth_xenu for invaluable advice on improving important edits/scenes, Neglify for sheperding me through the submission process, and njvc again for making an awesome motion menu that will be used for an upcoming DVD version. - In theatrical release, during the briefing, Shaw states that the engineers created humans as if it's a fact, and then when asked by a fellow scientist to back that up, then gives her "what I choose to believe" line, which renders this important aspect of her character ridiculous. Here, she makes it as a direct statement of belief straight up, which then gets mocked by Fifield. - Stitched together new line for Fifield to explain why the keeper of the "pups" gets lost: "I can't connect us to my pups' map"
- Included Janek's talk with Vickers, which gives him a much better reason for sacrificing himself at the end. It intercuts the scene of David talking to Shaw about her pregnancy. Added music. - Included extended conversation between Vickers and Weyland, a good character moment for both of them, especially giving some nuance to Vickers, and also has acknowledgement that Weyland's circle is aware of Shaw's "child" on the ship, via Vicker's "thing squealing next door" line. Added music and sfx. - Included the extended conversation between the humans and the engineer. Mix of theatrical and alternate footage. Added music. The original Prometheus is an overall decent film but is very flawed, thus it's not hard to see why it's so heavily divisive among critics, audiences, and fans of the Alien franchise. 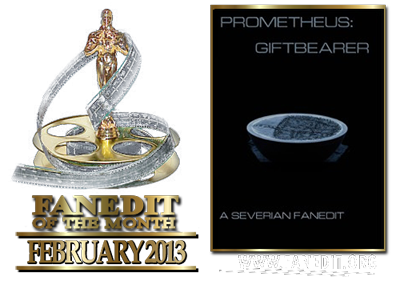 Prometheus: Giftbearer reincorporates much of the deleted material to create a much richer, smart, and more satisfying and thought-provoking experience that works beautifully not only as an Alien prequel/spin-off but also as a standalone sci-fi/horror film. The footage added in makes the story, themes, and characters more compelling and much better-realized than in the theatrical version of the film. The editing is absolutely flawless. The additions of Peter Weyland's TED Talk and Elizabeth Shaw's video message to the Weyland Corporation really give the film much-welcome depth and make the events play out feel personal. Fantastic stuff. As for many, Prometheus was a massive disappointment for me. Since then it has grown on me and now I can appreciate many things about it - still, it's full of flaws. 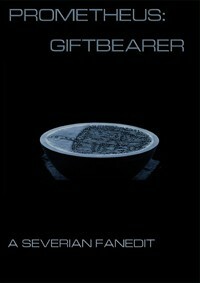 This edit not only improves upon many of the original film's flaws, but I believe "Giftbearer" is finally a good, standalone movie and I would gladly recommend it to anyone who hasn't seen the original or any of the Alien films. The original Prometheus movie is an awful mess, besides being a huge disappointment for fans of the franchise expecting a real prequel to the Xenomorphs, in my opinion. Severian has taken what is a complete mess and made a really respectable vision of the movie, I really enjoyed this edit. The beginnig of it with the Ted Talk scene brings a whole different perspective. The narrative has been greatly developed to show you humans seeking for something and clashing with a huge mistake. Thanks for this edit, most definitely replaced the original for me. This version has a much better linear and understandable structure than the original and looks superb. My only complain is that the audio has only 2 channels and appears to be clipping on loud moments. Great work Severian, you have engineered a much improved film.